"Where can you find the best city air quality across the U.S.? Homeowners may be a bit surprised to find out the answer – after all, less than half of Americans (41%) report that they don’t think about the air they breathe in. " Drum roll...the results are in! Does your city rank in the top 10 with the cleanest air, according to the AirGenius Awards, sponsored by the makers of the Honeywell AirGenius Air Cleaner. The awards, evaluated by scientists at the global consulting firm Environmental Health & Engineering, examined city air quality criteria such as pollen counts, pollution and access to parks. And, for the first time, San Francisco takes #1 spot from Florida’s Palm Bay. Florida cities Cape Coral and Palm Beach ranked #2 and #3. So, how did your city rank? Did it even make it on the list? While I no longer live in MA, I was happy to see Boston, MA rank #5, as I still have family and friends who live in that area. A few of them I told about the results laughed, as they didn't think Boston ranked high on the list of clean air cities. Who knew, right? Well, if your city didn't make the list, not to worry as you can still provide a better air quality in your home for your whole family, including the pets, thanks to Honeywell's line of air purifiers. I have reviewed and shared my thoughts on a few of Honeywell's air purifiers over the years, as my family is plagued by year round allergies. We find that if we run air purifiers throughout the day and during high allergy months, that we suffer less and that our breathing is easier thanks to the cleaner air. And, when colds hit our house, I make sure to have our Honeywell air purifiers in working order, with clean filters, to help rid the air of germs, and help us shake the colds quicker. "Allergens can be a major interruption to your daily life– but maintaining indoor air quality shouldn’t be. The new Honeywell True HEPA Air Purifiers provide trusted allergen, germ and odor reduction by capturing up to 99.97% of microscopic airborne particles that pass through the filter (as small as 0.3 microns – 250x smaller than the width of a human hair!). The HEPA filter effectively captures airborne grass, tree and other pollen, dust, smoke, pet fur/dander, mold spores, bacteria and virus. The pre-filter also absorbs odors and volatile organic compounds that result from cleaning supplies, new carpet, paint, and some types of furniture." Overall, I have to say that the True HEPA Compact Tower from Honeywell works well, and would definitely recommend it to those with small living spaces. You, too, will be amazed at how well this compact air purifier works and how quiet is really it. There were a few times I forgot to turn it off, as I couldn't hear it. But, I knew that it was on when I walked in the room, as the room's air quality was better than other areas in the house that we don't have air purifiers running. 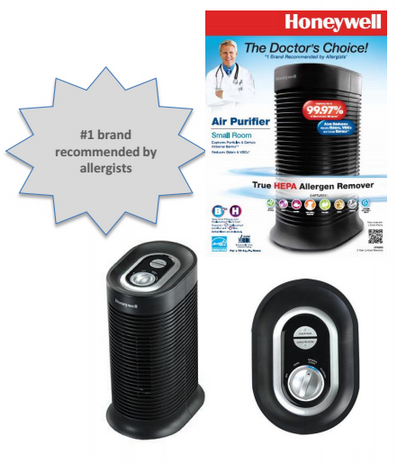 To learn more about the popular Honeywell air purifiers (#1 brand recommended by allergists), including the new True HEPA Compact Tower, visit www.HoneywellCleanAir.com today. You can purchase these and other Honeywell products directly from their website, as well as find them at your favorite local retailer and online stores. Thanks to the kind folks at Kaz, one lucky reader will win the new True HEPA Compact Tower (HPA060) from Honeywell, to help create cleaner, fresher air in their home. To enter this giveaway, please complete the entries on the Rafflecopter form below. Good luck!